This guide aims to assist those who are researching the history of settlements and their residents. Although the history of each parish is different from that of its neighbours, they will all have gone through many common experiences, for example the Norman Conquest, the Reformation, and the influence of railway construction. Both local and family historians are interested in learning about the places where people lived, how the natural and man-made environment shaped their lives, how they spent their time and what their problems and achievements may have been. Few ordinary people of the past left much evidence of their personal circumstances and so today’s historians have to glean what they can from surviving evidence. The usual starting point for this is parish records because they contain personal facts, such as age and occupation, and details of significant life-cycle events especially baptism, marriage and death. Parishes are communities under the care of a church minister but, historically, their function was not only religious. In Tudor times their importance as the basic unit of official administration began to increase. Rate-payers in each parish formed a ‘vestry’ to manage the responsibilities for providing local services given to them by central government. These included the authority to raise local taxes and spend them on poor relief, the maintenance of highways, the up-keep of churches and parish buildings, the salaries of local officials and the supply of recruits for the militia. The written records of vestries together with church registers of baptisms, weddings, funerals and other important documents were often stored in churches in stout, locked boxes known as ‘parish chests.’ Most of the surviving parish records have been lodged with Lincolnshire Archives Office and provide researchers with a rich source of information about individuals and life in the parishes they once inhabited. By the end of the nineteenth century civil parishes administered by elected councillors had been created. Their geographical boundaries were often different to their church parish predecessors, many of the old vestry responsibilities had been passed to district or county councils and links between the church and lay administration were severed. Church records continue to be kept and, like local government records, deposited in the Lincolnshire Archives Office providing important material to historians. In addition to publications on local history available through the Lincolnshire Libraries Service, the Bishop Grosseteste University Library houses the Lincolnshire Collection, which includes the SLHA Library previously housed at Jews' Court and the Tom Baker and Dr Jim Johnston Collections. The Collection can be accessed by members of the public on a reference basis. A selection of Local Studies Essays is also available to view. Further details about opening hours and planning your visit can be viewed here. Whilst several of the sites listed below are subscription services, some are available free at your local library; Ancestry, Find my Past and the British Newspaper Archive for example. It is, therefore, sensible and useful to look at some general sources at an early stage of the research - for example the Society has produced a number of publications. In addition to publications on local history available through the Lincolnshire Library Service, the Bishop Grosseteste University Library houses the Lincolnshire Collection, which includes the SLHA Library previously housed at Jews' Court and the Tom Baker and Dr Jim Johnston Collections. The Collection at BGU can be accessed by members of the public on a reference basis. A selection of Local Studies Essays is also available to view. Further details about opening hours and planning your visit can be viewed here. Through The Lincs to the Past website you are able to access all publications, old records and museum artefacts held by Lincolnshire County Council. The site also contains many photographs and other images, which you are able to view and then order for a small fee. The site enables you to book a visit to the Lincolnshire Archives. Although Volume 2 of the VCH for Lincolnshire was published more than eighty years ago, it is nevertheless a work of reference that in many respects has not been replaced. Half the volume is devoted to Ecclesiastical History and separate histories of the religious houses of the county, numbering no less than 125 and including Lincoln cathedral and Crowland abbey. The second half of the volume contains chapters on Political History, Social and Economic History (including a table of population summarising the first eleven national censuses), Industries, Agriculture, Forestry, Endowed Schools, and Sport. Rather confusingly, volume 1 was never published! Many parish historians are residents of the places on which they intend to do research, but even for them an important exercise is to walk round as much of their parish as is accessible, noting landscape features such as rights of way, watercourses, the location of parish boundaries, patches of woodland, as well as buildings. It is worth buying a current Ordnance Survey 1: 25,000 (Explorer) map on which to record observations. The maps are also available on line. The map will show the present-day boundaries of the civil parish, which in many cases will be identical to the boundaries of the ancient parish. However, because many small ancient parishes have been combined, more reliable guides to ancient boundaries are the early editions of the OS Six-Inch maps. The First Edition One-Inch Ordnance Survey Maps for Lincolnshire were originally published c.1824. Later editions had additions, mainly confined to railways. David and Charles and Cassini modern reprint editions are available. Your local library may hold copies. Some parish Enclosure Award maps are held by the Lincolnshire Archives Office. Many of the old maps are now available on line. Old Maps is a comprehensive archive comprising site centred historical maps covering England, Wales and Scotland. The site provides a complete step by step picture of land use changes that have taken place from the mid 19th century onwards, from the OS County Series, OS Town Plans and post-war National Grid mapping to unique Russian Maps of UK target locations from the cold war era. The National Library of Scotland has produced a large digital archive of national and local maps. In the 'Map images' resource you can access and view all the maps they have scanned as high-resolution, colour, zoomable images. 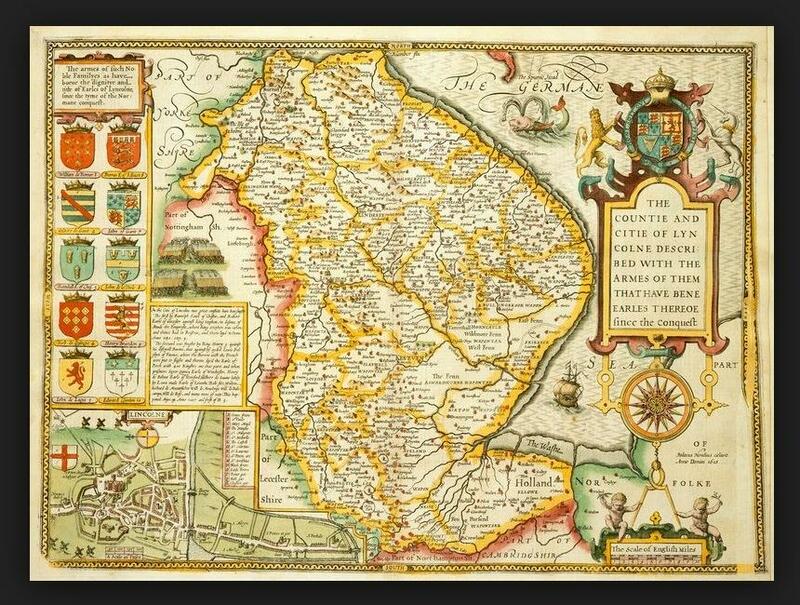 The maps date between 1560 and 1964 and relate not only to Scotland but also to England and Great Britain, Ireland, Belgium and Jamaica. The easiest way on the NLS site of finding material relating to any particular location is to find by place. Search using a map, by place name, or by county and parish name. The boundaries and extents of all the map images are shown as clear coloured overlays that you can select and view. Lidar has many applications in the field of archaeology including aiding in the planning of field campaigns, mapping features beneath forest canopy, and providing an overview of broad, continuous features that may be indistinguishable on the ground. The composite data covers over 72% of England (no Wales, Scotland or Northern Ireland yet as this data is held by the devolved agencies). Resolutions available are 25cm, 50cm, 1m, and 2m, but coverage appears very limited at the higher resolutions. The 1m data appears to strike a good balance of coverage and detail. This site features some of the DSM 1 metre data with contour shading to produce a zoomable map. Trade directories listed all businesses and tradespeople in a particular city, town or village, as well as providing a general directory of postal addresses of local gentry, landowners, charities, and other facilities. In effect, it was a Victorian version of today's Yellow Pages. Leicester University has asembled a collection of digitised trades directories (for example White’s, Kelly’s, Post Office) covering England and Wales from the 1760s to the 1910s. Newspapers are a brilliant research tool for anybody interested in the past. You can discover the way historical events were originally reported, unearth forgotten stories and find details of your own family history. The British Newspaper Archive provides online access to local and regional newspapers dating from the 1700s. This is a subscription site offering monthly, annual or 'pay as you go' payments; free access is provided by the Lincolnshire Libraries Service. The first modern, complete UK census was taken in 1841, and thence every 10 years. Records are available until 1911. The 1921 census will be available in 2021. The 1931 census was destroyed by fire during WWII (where many WWI military records were also destroyed). There are many sites specialising in these records. Many of these sites also give access to military records. Most sites require a subscription to gain access. * The 1939 Register, taken on 29 September 1939, provides a snapshot of the civilian population of England and Wales just after the outbreak of the Second World War. Details of around 40 million people were recorded in more than 65,000 volumes (transcript books). The 1939 Register is a digital-only record: the original register books have been retained by the Health and Social Care Information Centre now named NHS Digital, and are not held at The National Archives. Help on more detailed research on your family history can be obtained from Lincolnshire Family History Society. You can also contact many of the local history groups throughout the county, listed on the 'Links' page on this site. In addition to the above sites, service and medal records are available from specialist sites such as the Forces War Records site. A record of every military cemetery is held by the Commonwealth War Graves Commission which can be accessed from their website. Information on your local war memorial can be found at the Imperial War Museum website. The militia was a trained force of part-time soldiers created to give support to the small regular army when invasion or large scale civil disorder appeared likely. Parishes were responsible for providing the number of recruits ordered by a deputy lieutenant of the county and these were selected by ballot. Alternatively substitutes could be obtained from other parishes on payment of a cash sum, usually around £10 per recruit. The written documents produced are often called militia lists and they include: ballot lists - the names and details of men from the parish to be included in the ballot; adjutant returns and similar lists - lists of those serving usually covering more than one parish; regimental records - Lincolnshire had three militia regiments; justices certificates - confirming the substitution of a balloted man. Lincolnshire Archives Office holds many of these documents with many, but not all, dating from the second half of the eighteenth century. They provide useful details of individuals from a time before the introduction of the population census. Historic Environment Records are an important starting point for anyone interested in the archaeology, built heritage, and history of an area. They can provide information on a wide variety of buildings and sites, from finds of prehistoric flint tools to medieval castles and Second World War pillboxes. HERs (sometimes referred to as Sites and Monuments Records) may be held by County Councils, District Councils or Unitary Authorities. In each case, the record will cover the whole of the local authority area. Selected major historic towns and cities are covered by Urban Archaeological Databases (UADs). In many cases, UADs are held as part of, and are accessible via, the local Historic Environment Record. Where there is a separately-held UAD, this is represented by its own entry in the list and a separate dot on the map. The Access to Research site gives free, walk-in access to over 15 million academic articles in participating libraries across the UK (including Lincolnshire Libraries). Students and independent researchers can now access many of the world's best academic papers from leading publishers who have made their journal content available for free.